Founded in 2011, after 6-year striving and accumulation of experience, LCSC has become the fastest developing online store of electronic components in China, serving 530,000 customers and processing around 2,000 online orders per day by 2017. LCSC has a strong commitment to offering a wide selection of genuine, high-quality electronic components at best price. With the above achievement in domestic, LCSC decides to continuously provide the most valuable and trusted service for global customers. At that moment we have EasyEDA joined as a like-minded partner. The mission at EasyEDA from the very beginning has been to make an easy to use, web-based, approachable and free EDA tool for global engineers, makers, hobbyists, and geeks. 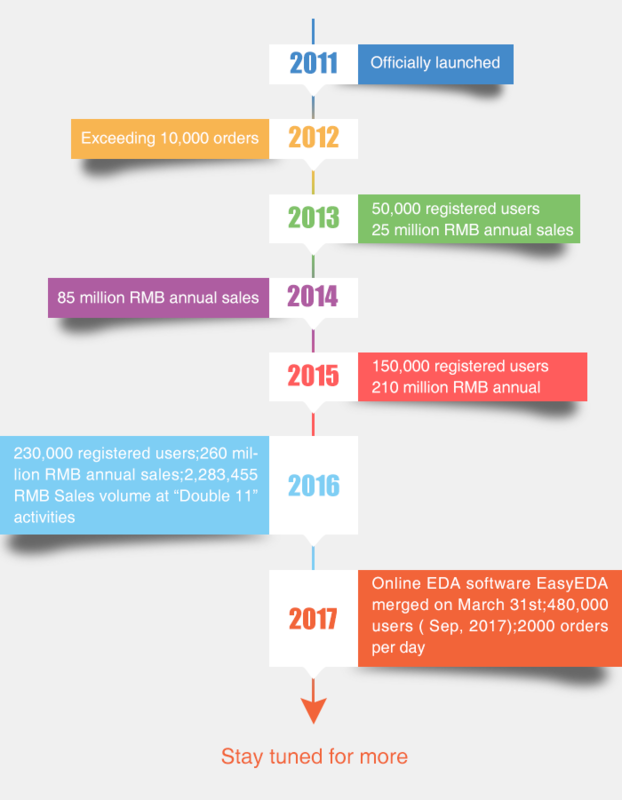 From 2010 to 2017, over the past 7 years, EasyEDA has served more than 220,000 users designing 255,000 projects. LCSC can provide the cost-effective electronic components meanwhile EasyEDA is able to empower users with free but professional design tool. The merger for two of us is a win-win situation to reach one plus one is greater than two results. We are going to strive together to make the world of electronics more accessible. LCSC has a self-owned warehouse with 10,000 square meters by stocking more than 100,000 kinds of parts. About 2,000 orders were processed every single day.